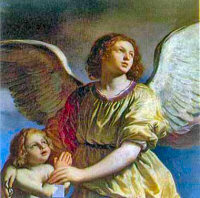 Today is the memorial of the Guardian angels. We all have one. Several years ago, I was making a left turn into our Church parking lot, very early in the morning, and I was side swiped. It was, ironically, the memorial of the Guardian Angels. And I was on my way to adoration. I wondered if my angel was asleep on the job. But the accident was my fault. Guardian Angels do not protect us from our own stupidity. Anyway read about our Guardian Angels here. This entry was posted in Angels and tagged Catholic, Guardian Angels. Bookmark the permalink. Susan, thanks for a wonderful post. I love my guardian angel and I always pray for the guardian angels for my children to always protect and guard them from harm. I’m so glad we have them!